Investors weren't excited about the e-commerce specialist's latest earnings report. 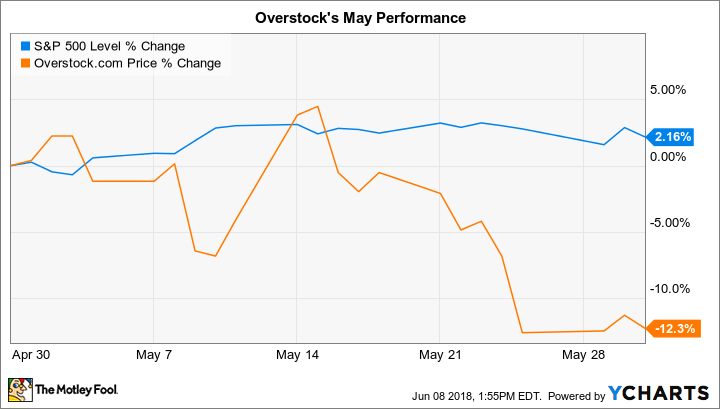 E-commerce specialist Overstock.com (NASDAQ:OSTK) trailed the market last month by shedding 12% compared to a 2% increase in the S&P 500, according to data provided by S&P Global Market Intelligence. The drop added to a tough run for shareholders so far in 2018, but the stock remains in solidly positive territory over the past one-year and three-year periods. Investors didn't find much to celebrate in Overstock's first-quarter results that were released early in the month. The updated numbers showed a sharp drop in profitability as the company worked to increase competitiveness against rivals like Wayfair, which have been stealing market share in the home furnishings industry. However, the reduced pricing didn't end that slide. Overstock's retail sales rose by just 3%, compared to a 48% spike for Wayfair. CEO Patrick Byrne and his team believe sales growth rates will improve over the next few quarters as the company continues spending aggressively on price cuts and marketing promotions. Executives are also excited about their investments in blockchain technologies. But, while cryptocurrency moves might make the stock more valuable at times, Overstock's long-run growth will depend on its retailing business that today is struggling mightily to keep up with industry peers.